Make an impression on your guests! An Estate gate or driveway gate from NatureRails makes a lasting impression on your clients and guests. Your custom designed gate can be made in any design to match your architecture and decor, even your logo. Custom gates in powder coated steel or aluminum are built to last! Custom fabrication to meet your every artistic metal need in a gate. We have access to a variety of hinge styles, latches and of course your gate will be made to your size and design requirements by award-winning graphic artist Rob Gerdin. Custom Driveway Gate or Entrance Gate in the Caribbean features many local fish and sea creatures with durable powder coat finish. Heavy metal gates keep your property secure. Gates keep little ones or pets safe on your deck, balcony or stairs. All gates custom designed and hand fabricated in aluminum or steel with your artistic vision at the forefront of every design. Trying to match up current railing? Every attempt can be made to locate the same materials or provide complimentary style gates for residences who already have existing gates to match up. No cheap, plastic gates here! We talk special attention to all your details after precision cutting and welding. Then we acid wash the metal with rust-inhibitor, sand blast it and then apply two coats of powder coating. First layer is primer and top layer is your final color / testure. Powder coat is a baked on enamel finish that stands up to weather and sun better than a paint. Low-maintenance so you can spend time having fun on the deck instead of sanding and staining it every summer. Select from steel or aluminum, then your gate is designed to meet your installation and style requirements. We then send you a proof of the design to approve. 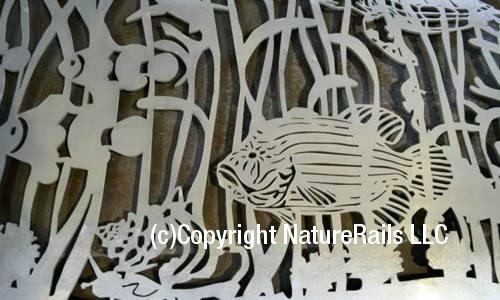 The very intricate design of your gate is cut with a water jet machine capturing every detail of the design (we don’t use laser jet or plasma to cut the metal as a water jet gives a much smoother cut). It is then sprayed with powder coating and baked on in a very large, hot oven. Your custom gate is then carefully packaged and shipped to your home or business. We have designed custom gates for customers that fit directly into masonry, garden gates, deck gates, interior stair gates, and driveway gates. One of our recent customers ordered a driveway gate designed to match the railing design on their wrap-around deck. What can we design for you? From design to the hinge and latch details, with our custom design services we are able to create exactly what you need. We ship anywhere UPS or Fed Ex delivers across the United States and Canada. Now also shipping to the Caribbean. Can I see your colors? I’m in! Let’s get started! If your question or project is more complex, sizes and a list of what your looking for can be emailed to [email protected] or Call 888-743-2325 with your questions for a FREE estimate. You may also send us a description of your project or questions using the form on the Contact Us About Your Gate Project page if you prefer. Even before powder coating this aluminum driveway gate it is stunning.